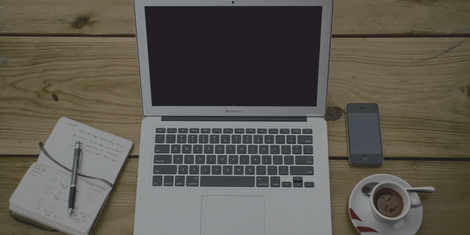 A great blog begins with great #content, but to be successful a blog also needs a strong community or audience. One of the most effective ways to build your blog’s community is with social media. When a member of your community follows you on social media they are giving you permission to send them updates — this is why blogging can be such an effective marketing strategy. It’s much easier to market to people who already like what you have to say.Facebook and Twitter are by far the most used social networks for bloggers, but they’re also highly competitive. On these platforms it’s hard to get noticed unless you already have a massive fanbase or are willing to pony up for sponsored posts. 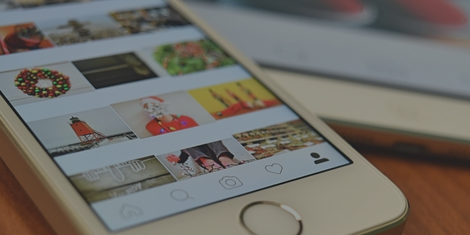 Instagram on the other hand is a great and often overlooked social media platform for bloggers. There are over 500M active users on the platform and since Instagram ads are fairly new, you don’t have to “pay to play” like you do with Facebook. The blog you’re reading right now gets over 1.2M unique visitors a year, and 10% of that traffic comes from Instagram! Today I’d like to help you decide if Instagram is right for your blog. 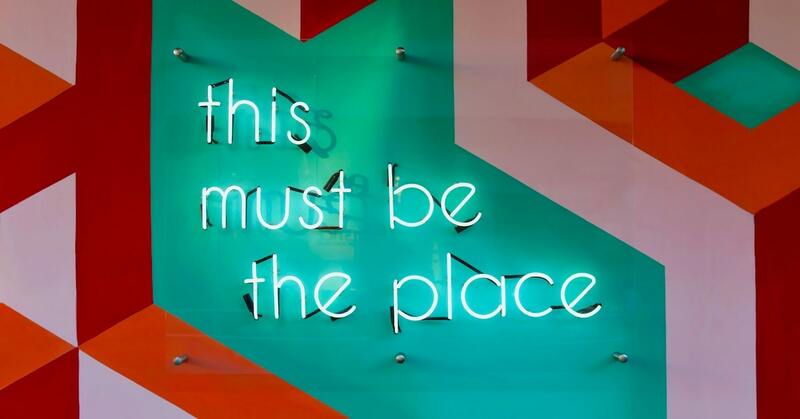 We’ll show you tactics that will allow you to get the most out of your efforts to market your blog on Instagram — the same tactics that have worked to help build some of the biggest blogs on the Internet. Include a link to your blog in your Instagram bio so people that visit your Instagram can poke around on your site. You can also point this link to a specific article or page on your blog. So if you’re a fashion blogger and just put up a new article called “Fall’s Hottest Fashion Trend? Bell-Bottom Jeans.” — change the bio link to send people directly to the article. Then make a post a picture of yourself in bell-bottom jeans, and mention in the caption that people can read the full article by clicking the link in your bio. People that follow you on Instagram are already interested in what you have to say, so the traffic you get from Instagram will be much more valuable than many other traffic sources.Instagram bloggers monetize their blogs in different ways, but the most common is through referral links. For example a fashion blogger might work with a company like Nordstrom and earn a commission on every customer they send their way. 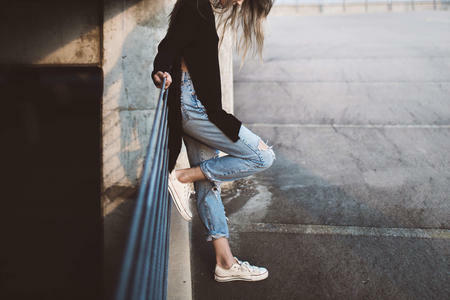 A person that likes your photo of bell-bottom jeans, then goes to your website to read the full article is way more likely to buy. In addition to driving traffic from Instagram to your blog, you can also drive traffic from your blog to your Instagram page.Why would you want to do that?There are many ways you can make money on Instagram directly, without sending people to your blog first. 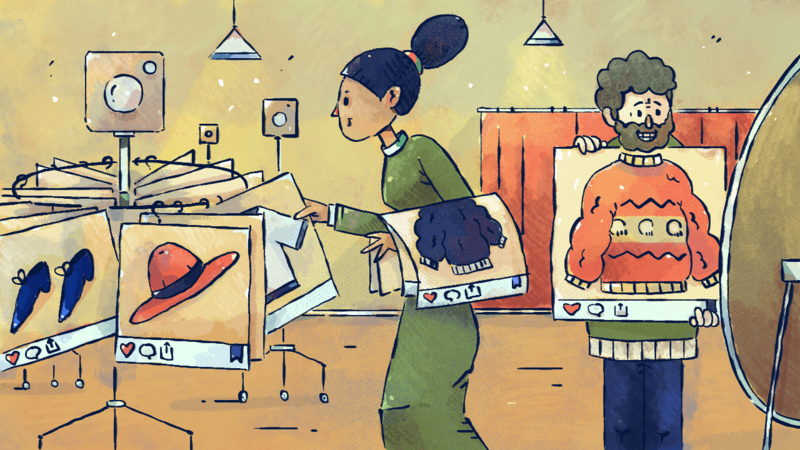 Services such as LikeToKnow.it can make your Instagram “shoppable,” reducing friction in the buying process.If you’re a fashion blogger, Etsy seller, or really anyone with lots of cool visual products to sell, this is a great strategy. Many businesses choose to use their Instagram for strictly branding purposes. By providing your followers with helpful tips and relevant advice about your industry, you can establish your business as an authority in a customer’s eyes. The company Reonomy makes software for commercial real estate brokers. On their corporate blog they give these brokers tips on everything from real estate technology, to selling during the slow season. They use their Instagram page (@Reonomy) to showcase cool buildings in New York City. 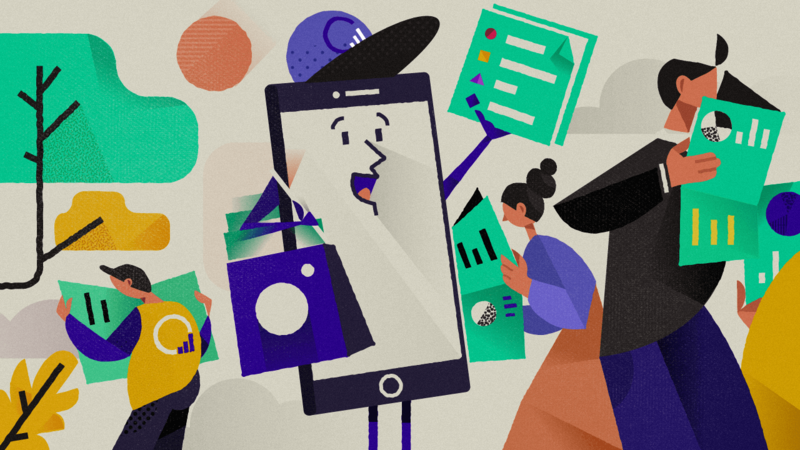 Their followers love it because it keeps them informed on everything going on in the industry, and Reonomy loves it because it keeps their brand top-of-mind. On Instagram people feel more comfortable interacting with brands than they do on Facebook, which means they’re more likely to like a photo or leave you a comment. Fans of your work can talk to each other, and ask you questions, right from Instagram. This sort of direct conversation is super helpful because it builds rapport with your audience, and builds the community around your blog. Engaging with your most loyal fans turns them into super-fans, people more likely to share your latest blog post with a friend. Blog posts take hours or even days to create but posting a picture on Instagram takes only a few seconds. Even if you don’t have anything new on your blog, you can still keep your audience engaged with a clever Instagram post.Instagram is also a great place to show off video content. Very few people watch videos embedded in blog posts, but Instagram’s algorithm treats videos preferentially so you can be sure your content reaches a large audience.Instagram Stories are also a great place to show off your goofy side. Stories are candid and intimate. Your followers can go “behind-the-scenes” — learning what it takes to execute the perfect fashion shoot, or research your latest blog post. For more on how your business can make the most of Instagram Stories, check out our Ultimate Guide to Instagram Stories for Business. To determine if Instagram is the right social platform for promoting your blog, first you’ll need to identify your target reader. Some people use a lot of social networks, while others just use one or two. Your task is to figure out who your target reader and what social network that reader prefers. If your blog is more geared towards business readers, you might have better results promoting it on LinkedIn. But if your target reader is more visual it might make sense to focus exclusively on Instagram. But if your blog doesn’t fall into one of those categories, that doesn’t necessarily mean that Instagram is a bad fit. You’d be surprised at the type of blogs you can find on Instagram. The thing about Instagram is it can take any topic and make it interesting, you just need to go about it in a fun and creative way. Bloggers take what they know or what they love and they create a story on Instagram that is a visual representation of their brand. If your story is compelling enough — even if its about something boring — you can probably find an audience for it on Instagram. Don’t know where to start on curating your own Instagram account? We’ve compiled a small list of what we, and thousands of others, deem some of the best Instagram bloggers around. 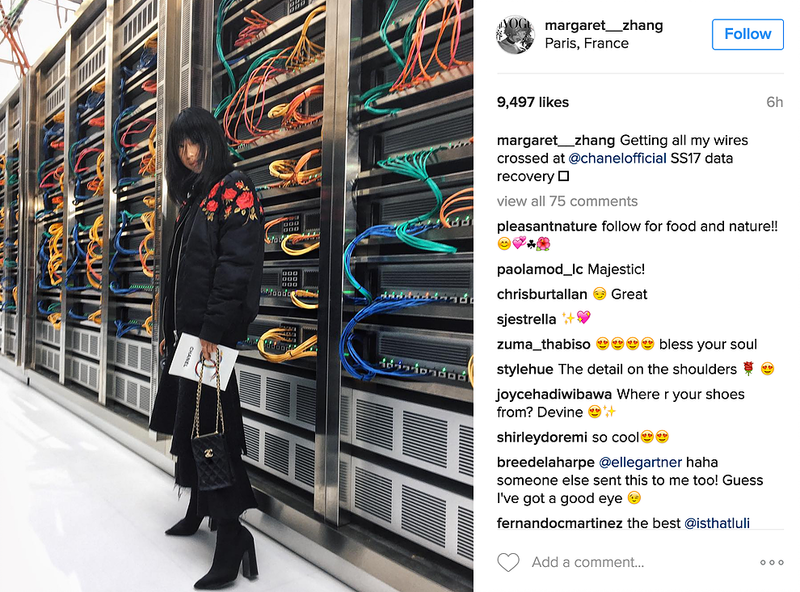 Margaret Zhang is an Instagram powerhouse. Her Instagram feed embodies what it means to live a luxurious lifestyle. She is very communicative with her fans giving them tips on how edit their photos and promote their own Instagram accounts. 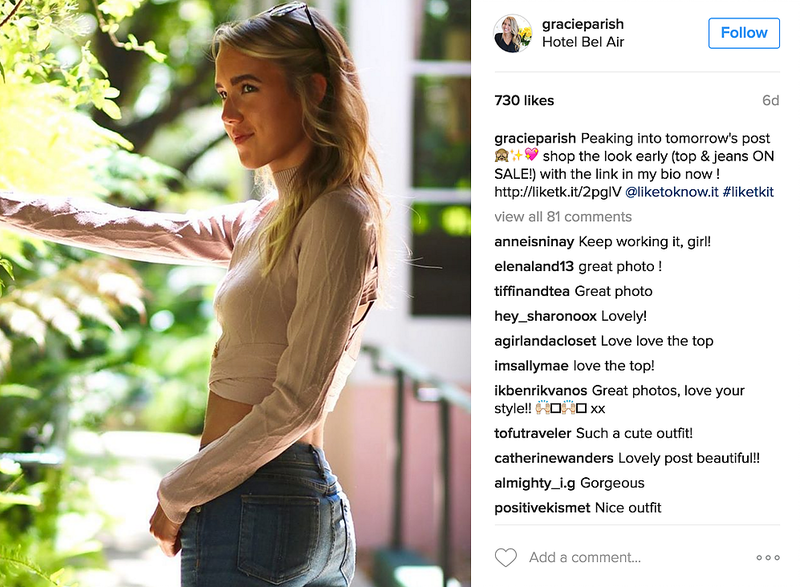 Gracie Parish loves to showcase her fashion, beauty, and fitness tips. She has turned her feed “shoppable” so her fans can “get the look” right then an there. Everyday Carry took a simple concept and rolled with it. Wallets, keys, bracelets, whatever is in your pocket, showcase it to the rest of the world! 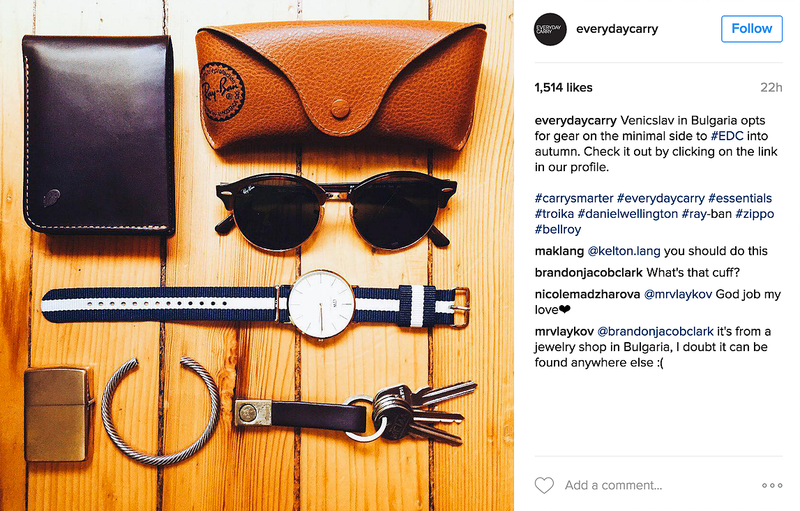 Their hashtag #everdaycarry is a “thing” on Instagram with over 1 million posts. You’ve probably heard of them from a friend or perhaps already follow them on Instagram. Humans of New York is widely popular and were some of the first Instagram adopters. Their blog has garnered a massive following. They even had a book deal that came in large part due to their Instagram presence. The Foodie Whisperer’s Instagram will make you want to eat all the time. Check it out! Link your Instagram back to your blog. Every Instagram post should link back to your blog in some way, whether it be a hashtag, a self-promotion in your caption, or a link to your blog in your account bio. Showcase new blog posts in your bio link too. Whenever you write a new blog post, make an Instagram post directing people to your bio to check it out. Two words: branded content. Get in the habit of branding your stellar content with your company or blog’s logo for more visibility. Your profile is your “first impression. Think of your profile as your follower’s first impression of your brand and business. Make sure to take time and pay attention to detail when developing the overall look and composition of your account. Be social. Make sure to comment on other people’s posts. Network! Follow other people’s accounts. This helps build your audience organically. Return the favor. Try to respond when people comment on your page. Engage in conversations with followers. This helps to build a repertoire between you and consumers. ###### We can’t express this one tip enough: use hashtags wisely! That small little word may seem inconsequential, but hashtags are a representation of your business and brand. Consumers associate hashtags with your content. Your hashtag is your brand. Consistency is paramount. Try to be consistent with posts on Instagram. Don’t post to much at one time, because followers will get annoyed. Plan a posting schedule. This will help you stay connected with your followers. Work with influencers. Check out the influencer marketing stack. We’ve given you some benefits, listed some successful Instagram bloggers, and provided you helpful tips on promoting your blog on Instagram. Now it is time for you to take the next step. Showcase your work, promote your brand, don’t be afraid to put something out there for the world to see.